Counting to 10 in 10 languages is made easy with this global snapshot of Los Angeles, California. 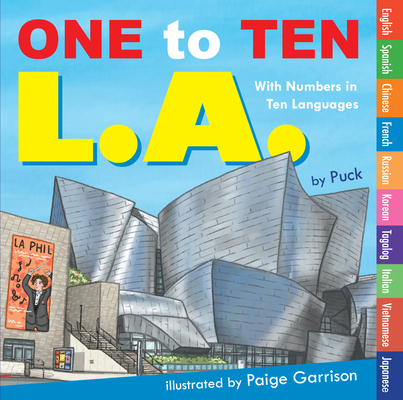 Featuring the numbers in the 10 most common languages spoken in LAincluding English, Spanish, Chinese, French, Russian, Korean, Tagalog, Italian, Vietnamese, and JapaneseOne to Ten L.A. captures the most iconic images of one of the most diverse cities in the world. Puck is the author of dozens of children’s books, including New York Baby and My Foodie ABC. He is also the creative chief behind duopress labs, the company responsible for books such as My Fridge, The Belly Sticker Book, 100 Pablo Picassos, and many more. Paige Garrison has illustrated several books, including Roanoke Baby and One to Ten LA, as well as assisted with Beach Doodles and 100 Pablo Picassos. Before transitioning to children's books, Paige worked for Bento Box Entertainment on the animated TV shows Bob's Burgers and The Awesomes. She currently lives in Los Angeles, California, with her loving husband and their silly pup.